It was raining this morning so I didn’t work on the front house walk. Hmmmm, now it’s been two weeks since I did something. 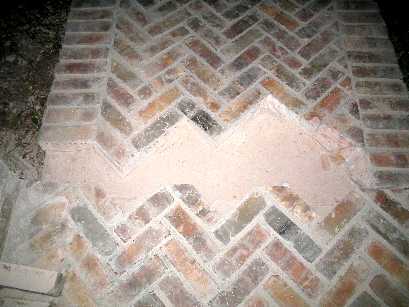 I need to get some more mortar chipped out and begin on cutting bricks to fit. However, Matthew came home today which was nice. It’s been a while since we’ve seen him. Katie has been working and arrived to join us for lunch. 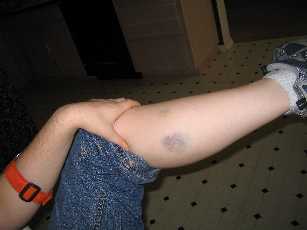 She showed a bruise that she has gotten at work. Although Matthew’s visit was short we chatted, he and I caught a movie (Murderball), and we all had dinner at the Cheesecake Factory. Then he was gone. Back to college and to a party with his sweetie. Yet we’re glad he’s happy, busy and doing well. IBM has a mechanism to create an internal open source project so I thought I’d give it a try. So today I proposed a project to provide a Java interface to the IBM LoadLeveler product that only has a C/C++ interface. Right now I’m in the start up phase. This means that I’m just getting the code library and other associated administrivia done to set up the project. For example I need to get my manager’s OK, and as a secondary I’ve asked for approval from the LoadLeveler manager too which I’ve gotten. We’ll see if it flies. I doubt anyone else would be interested in helping, but you never know. I’m hoping there might be one or two other people in the company that might be interested in helping me with it. The project continues… The chipping of old bricks is almost done. I’m down to the concrete base in all places. I still have a bit of mortar to remove from the sides of a few bricks. Now I have to begin cutting bricks to fit into the space like a jigsaw puzzle. Wish me luck. 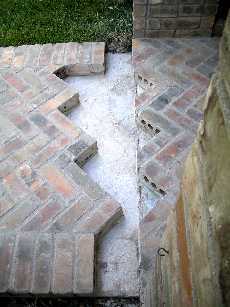 I continued working on the front walk by chipping out the old brick and mortar. Today I bought a grinder and masonry blade to help me. It runs at 11,000 RPMs and cuts the brick like butter. 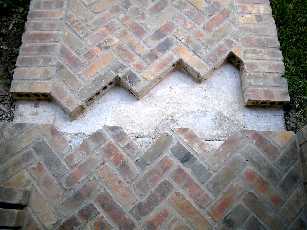 I use it to cut striations into the bricks and mortar so I can chip them out easier with the chisel and hammer that I had bought previously. I have to chip it down to the concrete pad. This means I not only have to get rid of the brick, but also the mortar beneath it. I am slowly getting it done and the grinder was a great help. You are currently browsing the Watt's Up blog archives for July, 2005.